With 100 deaths a day, when will the U.S. renew campaign for safer motoring? How outraged and motivated to political action might you be if an avoidable disaster in a week claimed the lives of all the youngsters in your kids’ school? How upset might Americans be if a calamity wiped out in 24 hours seven NBA professional basketball teams, or two pro NFL squads? David Leonhardt, associate editor of the New York Times Editorial Page, threw a powerful jab in his Op-Ed at lawmakers and regulators who, as always, seem to be shrugging off not only the summer deadliest season but also the rising annual toll of road deaths. The carnage has made America’s streets and highways the most dangerous in the industrialized world. As Leonhardt points out, federal data show that 100 people die daily in US vehicle wrecks. Many are young. They’re killed by drunken, distracted, and drugged drivers, or they die due to their own bad decisions, including poor maintenance of their vehicles, or because of bad luck. Meantime, as the toll mounts — it rises most in summer, when we all race to pleasure activities — the tens of millions of us who are legal drivers turn a blind eye to the considerable, even lethal, risks we run when motoring on any given day or at any given hour. In fact, Leonhardt argues, Americans get distracted from the major issue — the need to pursue policies and practices that other nations have, and that slash road deaths. Instead, the public and policy-makers, especially, are crystal ball-gazing, tying themselves up in knots about the safety of autonomous vehicles — so-called self-driving transportation that even the most optimistic proponents don’t see fully on the road for a decade or more. He points to a Washington Post piece about congressional inertness on autonomous vehicle oversight. But to see just how much he’s on to a crazy distraction, just compare the coverage given in car crazy Southern California to serious multicar crashes (squibs or briefs) versus the head-scratching attention paid to every nick on Teslas — the gee-whiz vehicles that promote their assisted driving systems. In my practice, I see not only the harms that patients suffer while seeking medical services but also the havoc inflicted on them by their injuries in car, truck, and motorcycle wrecks. Leonhardt rightly points to groups like Families for Safe Streets in urging his readers, and all Americans, to wake up and to act against the nation’s rising road carnage. We all can take steps ourselves to safeguard our own and the lives of our loved ones. The deadly summer is far from over, and many lives can be saved and changed still. We can be sure we don’t drink and drive. We can re-examine whether any and all medications we take impair our capacities (yes, dope fans, that includes the dangers of marijuana impairment to driving). We can lock up our cell phones and other electronic devices in the glove box or in designated containers to ensure we’re not distracted by, frankly, stupid and useless information that we can access when we’re not behind the wheel of tons of steel flying at high speeds. 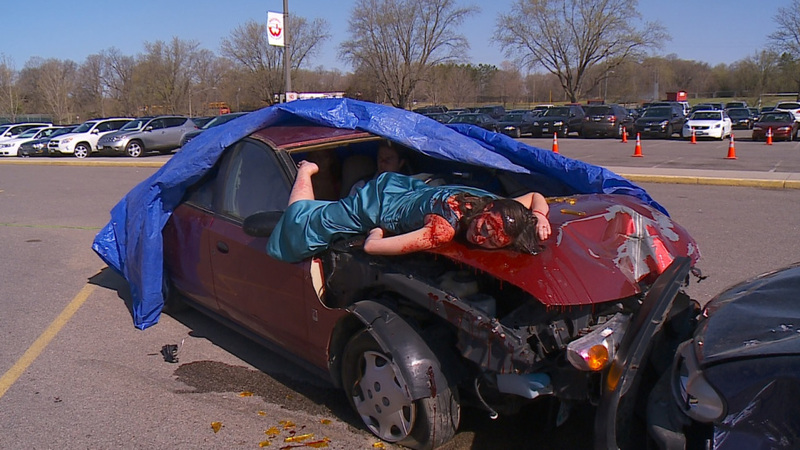 We can nag our kids, spouses, other loved ones and friends — maybe even with mock and grisly wrecks, as some Minnesota high schoolers did a few years ago (see photo above) — to join us in stomping out distracted driving. We also can push our elected officials, law enforcement folks, and policy-makers to put their mouths and our money behind research and safety improvements in our vehicles, streets, and roads. This could improve them for not only motorists but also bicyclists and pedestrians — many of them seeking to save money and the environment by getting out of cars and trucks. It’s utter folly to heed fiscal conservatives counter factual arguments about government governing best by doing so least, leading to tragic collapses of our critical transportation infrastructure and its safety. This all is unacceptable, and we can and must attack and fix this problem, as we have before with information, policy, and investments of time and resources.